The Case of the Haunted House by Douglas Quinn, a Mysterious Review. Review: 5th grader Quinn Higgins's new friend wants to learn more about the supposedly abandoned house at the end of a nearby lane but when they go investigate they find themselves more than a little spooked in The Case of the Haunted House, the third mystery in this series by Douglas Quinn. 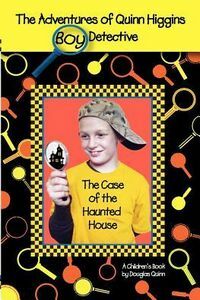 The Case of the Haunted House is a well-structured story populated by an engaging cast of characters. Possibly more importantly, the principal characters have character, if you will. It is more of a boy's adventure than mystery, as the resolution to the "case" is handled quite rapidly at the end with input from Quinn but without any deductive reasoning on his part … but this all seems quite appropriate, since an illegal activity was taking place with Quinn and his friends letting the authorities handle the capture and arrest. There are a couple of narrative sidetrips, including one about dealing with bullies, but on balance the main storyline and reading level seem suitable to and appropriate for 8- to 10-year-old boys. Acknowledgment: the author provided a copy of The Case of the Haunted House for this review.